Although the songs are better produced as before the songwriting is still typical Bastards of Love. There seems to be no real song structure in the traditional sense. What is different are the guest vocalists. Darrin Huss of Psyche is featured here and also Nora Below from Bpitch Control. This later was a bad choice. Her vocals give the music a very slick and cheap edge. Absolute highlight of the EP is the convincing Soft Cell cover ‘Martin’. 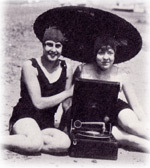 The Summer Destination EP is a prelude to the first full length cd album of Bastards of Love. Also to be released on his new home Déjà Vu music. I am curious what this new album will bring, but I am convinced it will never be as good as his first 12” and the album as Der Kunstliche Delittant. Those were the days his sound was really unique and these records are future classics.